On our final day in Chiang Mai, Tawn and I drove east of the city to search for Huen Jai Yong, a restaurant highly recommended by our hotel’s staff. Four or five people around the front desk agreed that this was the restaurant locals went to when they wanted to eat good Northern Thai food. 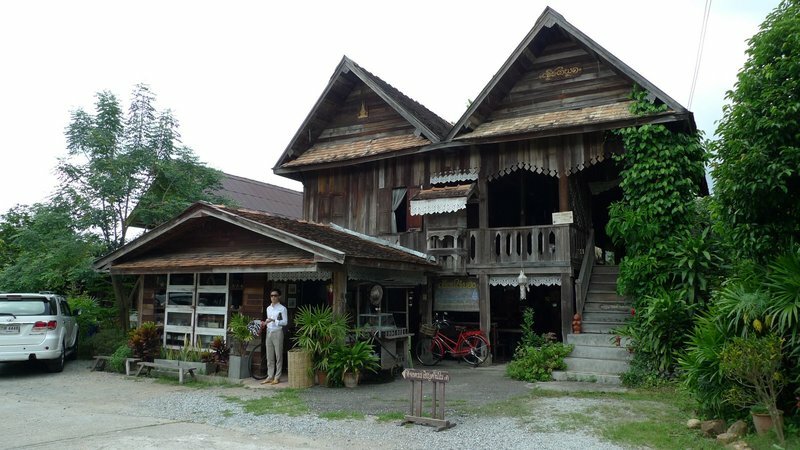 In fact, the restaurant is known particularly for its Lamphun style cuisine. Lamphun is the province directly to the southeast of Chiang Mai. 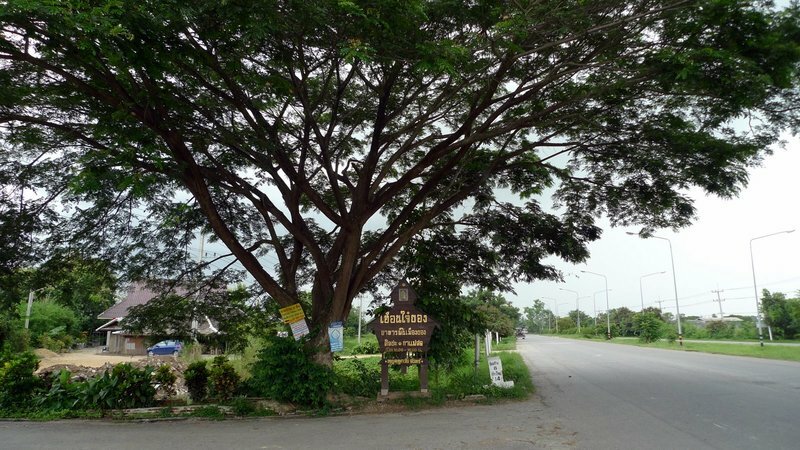 As I learned from Wikipedia, Lamphun traces its roots to the 9th Century, when it was founded by Queen Chama Thevi as the capital of the most northern of the Mon kingdoms in the area that is now Thailand. Located on Route 1317 some 15 kilometers west of the city, Huen Jai Yong still feels like it is out in the countryside. Its landmark is the large rain tree out by the driveway. In reality, though, civilization is fast approaching. Not a kilometer away, rice paddies have been transformed into housing developments. The gardens behind the restaurant were in the midst of lamyai or longan season, with the trees heavily loaded with fruit. Chickens were strutting about the garden, scratching for bugs amidst the herbs and vegetables. 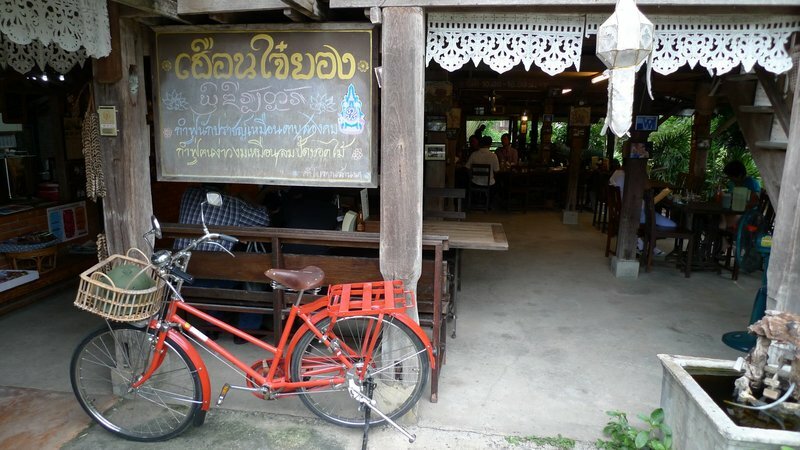 The restaurant itself is a charming old teak wood house, with seating upstairs, downstairs, and in a few adjacent buildings. A small gift shop is located out front where Tawn is standing. We opted for the open-air seating under the house. This picture doesn’t show it very well, but several of the tables are made from old long boats with planks added to make the tabletops. On the sign in pink chalk you can see the restaurant’s name in Lanna, the old Northern Thai language that traces its roots to a time when this region was a kingdom independent of Siam. We ordered a variety of foods, sampling several dishes we had eaten at Huen Phen as well as some specialties we had not tried on this trip. Sticki rice is a staple. 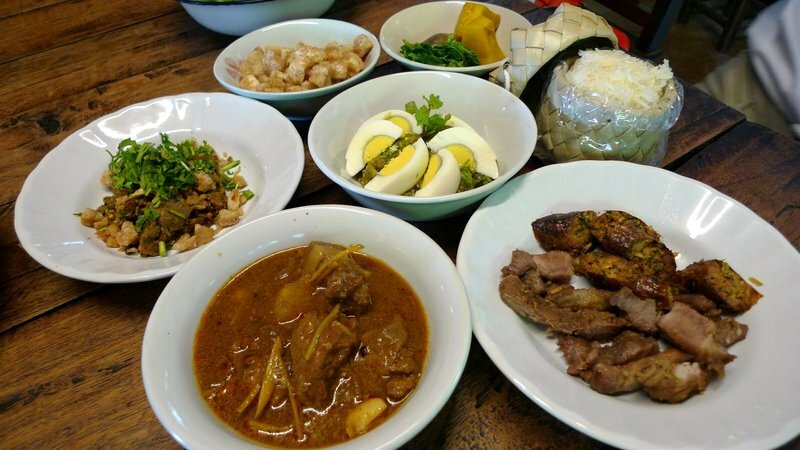 First, let’s answer the question, what makes Northern Thai cuisine distinct? Thailand has four major regions (North, Northeast/Issan, Central, and South) and each has its own style of cuisine although the have become increasingly merged as Thais move about the country. Generally speaking, Northern Thai cuisine reflects the peoples who have historically lived in, passed through, and traded with the region. These include the Mon, Shan, and other Burmese groups; the Hui and Taochew people from China; as well as Indian, Northern Lao, and Malay people. Northern Thailand is more mountainous, has better rainfall, and somewhat cooler temperatures than other parts of Thailand. The food tends to be heartier, a bit less spicy, makes more use of fresh herbs and vegetables, and makes less use of ingredients like coconut milk and fish than in other regions. 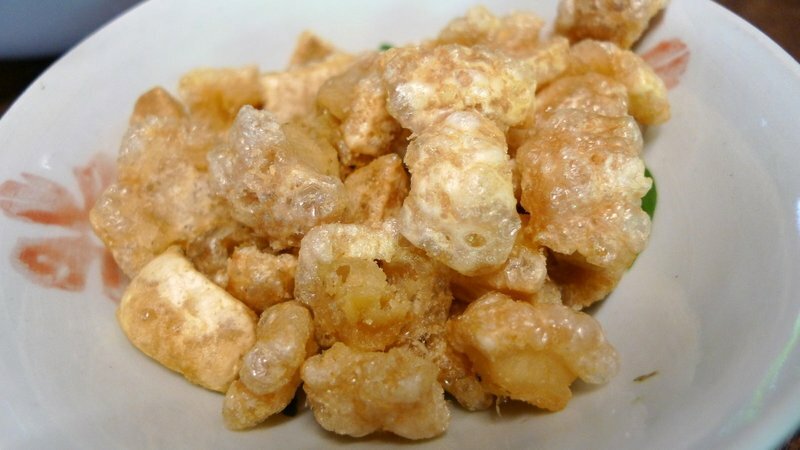 Whereas fermented fish and shrimp are used as a flavoring in other regions, you see fermented soybeans (trace the roots to China) used more commonly in Northern Thai cooking. 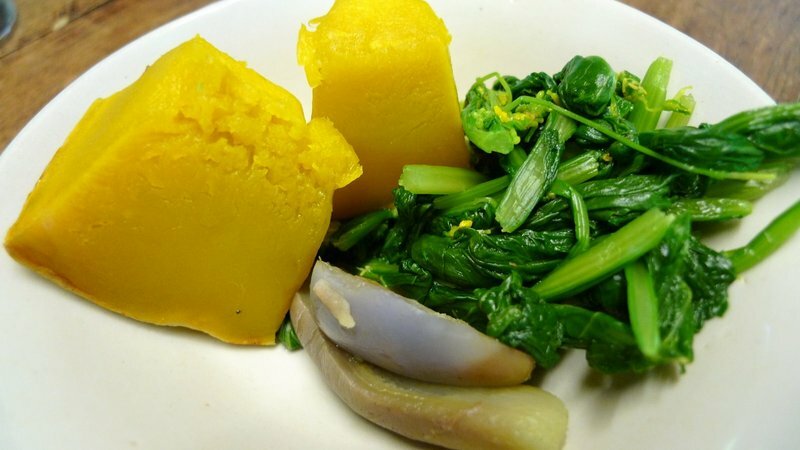 This dish of steamed squash and parboiled greens (similar to kale) and eggplant are served as a kind of side dish that you can go to for a break from whatever main dishes you are eating, kind of like the ban chan in Korean cuisine or pickles in many cultures. Once again we see the ubiquitous sai oua sausage, this time served with some muu tod or fried pork, known in the Northern Thai dialect at jiin muu. 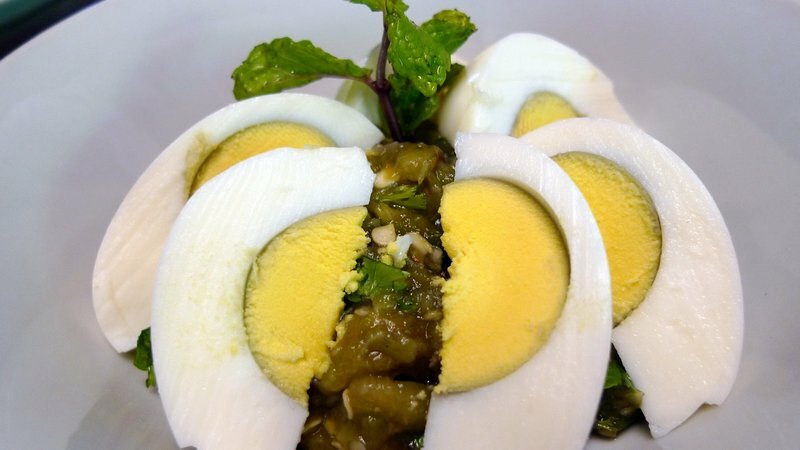 This dish, which is kind of hard to see thanks to the boiled eggs on top, looked at first to be nam prik noom, the roasted green chilli dip. In fact, though, it was tam baakeua, a salad made of roasted eggplant. Very tasty with the smoky meatiness of the eggplant enhanced with a variety of herbs and spices then served with the rich boiled eggs. 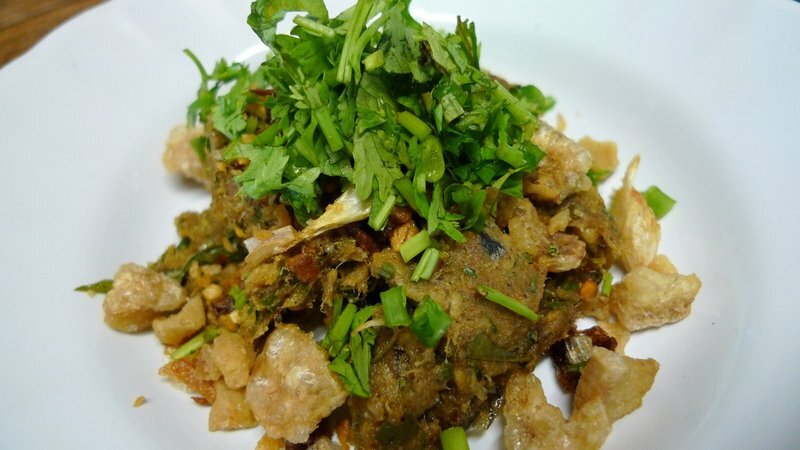 One option for eating the roasted eggplant was this dish of kaep muu or chitlins (as they are called in the southern United States), deep fried pork skin. Oh, so bad for you and yet so good, too! An unusual dish was larb kua plaa nin, of a salad of pan seared tilapia fish flavored with lemongrass, shallots, chilies, and other herbs. Tasty and similar to, but less spicy than, other chopped meat salads that come from the Northeast. Interestingly, I learned that tilapia was introduced to Thailand as a gift of Japanese Crown Prince Akihito in 1965 to H.M. King Bhumipol. It has adapted very well and is found in rivers all across Thailand. Another version of gaeng hong lay, the Burmese style stewed pork with a tomato based sauce. This particular version came very close to massman curry and was sweeter than the version we had at Huen Phen restaurant. While it was tasty, it was almost too sweet for my taste. Also interesting, it was made with fresh ginger instead of fried ginger. 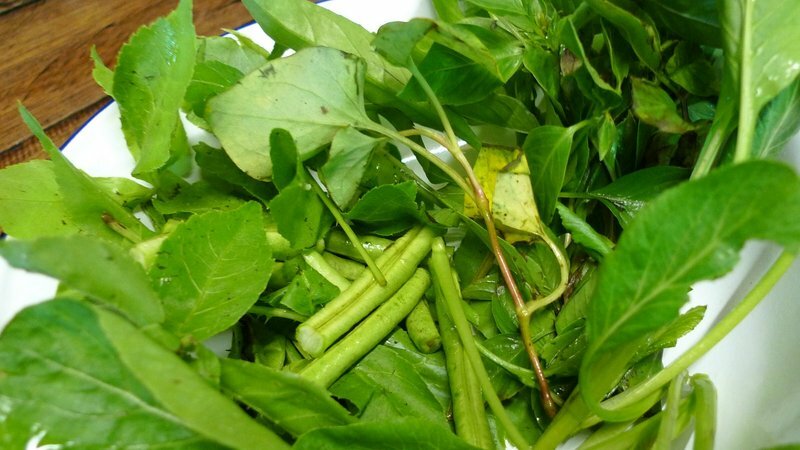 Northern Thai cuisine uses fresh herbs prodigiously and we were served this plate of various herbs and yard beans. While I didn’t confirm it, I get the impression that these herbs are grown on the grounds of the restaurant. 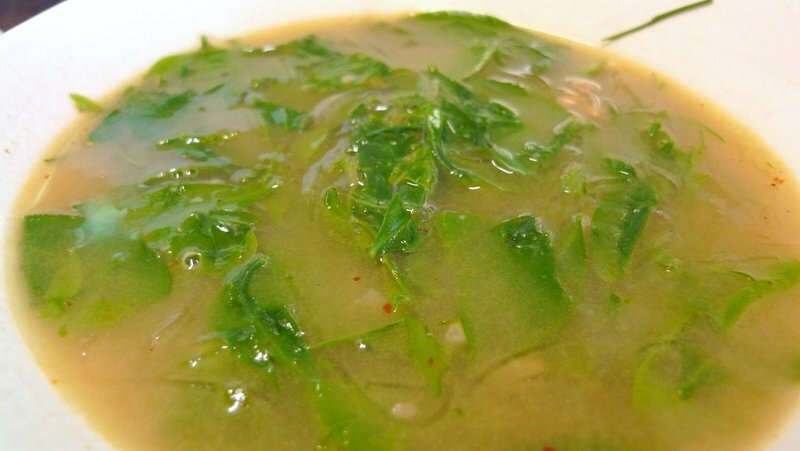 We ended our meal with gaeng pak waan, a soup of “sweet vegetable” which are the tips of a vegetable similar to spinach but much less earthy in flavor. The broth is made from dried fish. Our bill came out to about 400 baht for the two of us, about US $13.50. The meal was a perfect conclusion to our trip to Chiang Mai. The food is tasty, fresh, healthy, and the flavors are perhaps more accessible than any other style of Thai cuisine. Now, the question is, when are you coming for a visit? Directions: From Central Airport Plaza take Mahidol Road towards San Kamphaeng (Route 1317) . Pass the junction of the Outer Ring Road and Route 1317 intersection, the make a U-turn at km 9. The restaurant will be on your left at the large rain tree. This entry was posted in Uncategorized and tagged Chiang Mai, cuisine, food, Huen Jai Yong, Lamphun, northern, Restaurant, thai, Thailand by christao408. Bookmark the permalink. 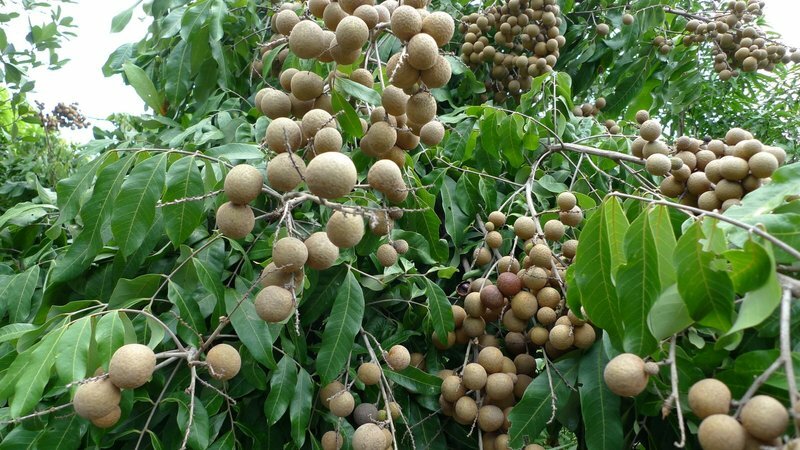 I like longan very much, does the restaurant allow you to pick them fresh from the trees? The vegetable dish and soup look delicious, I’d love to try this place on my next visit! So now you provide directions and review of the food lol. I will arrive as soon as possible. Very handy guide book you are compiling. Are you going to publish? You’re better than TAT in promoting Thailand. The food looks so interesting. The longan tree is fascinating. I’ve never seen them on a tree before. this entry (as well as others) would not look out of place in any travel magazine. The food looks good and I just can’t resist those fried pork skins, especially with some lean meat attached! wow, that looks good! thanks also for the explanation of what makes northern thai cuisine unique. maybe it’s a bias because all i have to go on is the food you post, but it seems like northern thai cuisine is also more vegetable heavy (or even more vegetarian dishes). is that true?i haven’t had longon in a while… although i like lychee better personally. God! That looks so good. I am coming in January, ( if my knee allows me. The total knee replacement takes place next month. So I am hoping I will be able to attend my niece’s daughter’s wedding end of January in India. ) If that is not possible, then I am coming to the Rotary International meeting in May. That would be just an excuse, because I will be coming only to see you and Tawn. Yayyyy! loved the squash and sweet veggie soups keep the good pics coming. We were in Chiangmai in 2006 so probably won’t make it there for a long long time. Brought my kids there and did all the touristy stuff like riding on the elephants. We hired a van that came with guide and a driver and had a really good time. @ZSA_MD – Zakiah, I’ll send my prayers for your prompt recovery so that we have the opportunity to show you and M around Bangkok in January. @icepearlz – I have to say, hiring and van and driver is a really good idea. Inexpensive and saves you the hassle. And riding elephants is a must-do for tourists. It may be “touristy” but it is one of those once-in-a-life experiences and helps keep the elephants (and their mahouts) employed. Better than having the elephants roaming the streets of Bangkok, begging, as was the case when I first moved here. @grannykaren – Glad you enjoyed. One thing I really like about Thailand is the year-round (local!) availability of squash and pumpkin. @kunhuo42 – Thanks for your patience, Aaron. My intent was to address the topic in the final entry but you asked early. As for your observation, I consulted with Chow, a friend who is much more in the know about Thai food. She says (and I quote) “Northerners love pig. 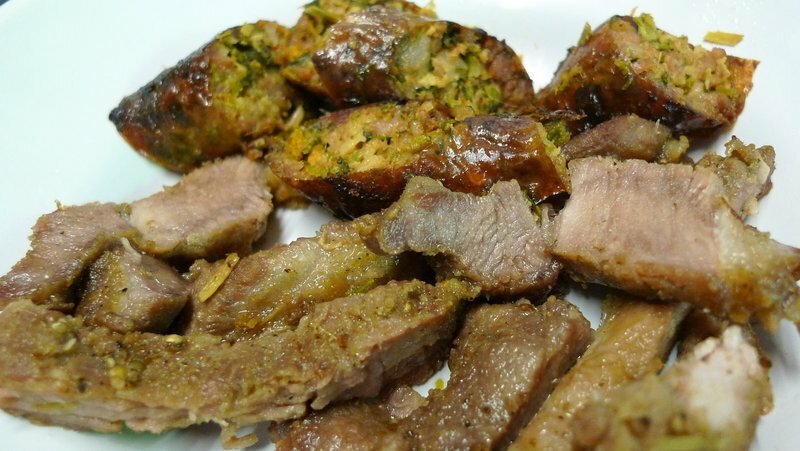 That said, it’s forest heavy and makes use of veggies and herbs not found in other regions.”@icapillas – Yes, pork belly is its many forms is a sign that there is a higher power! @murisopsis – Thanks for educating me on that. Did not realize that chitlins and cracklins were different things. @ElusiveWords – Thank you for that compliment. TAT doesn’t bother to show anyone Thailand, only an elusive version that probably never existed in the first place. @Ricardo98 – Standing by! @Inciteful – You are very generous with your words. I have no intent to publish but I do keep these notes handy. About once a month I receive a request from friends, friends of friends, or random people through Xanga, asking for suggestions and recommendations in Thailand. @Sinful_Sundae – That’s true of most of the tropical fruits, I find. Sadly…@Fatcat723 – I was on the fence about that precedence but it is a bit tough to find and is worth seeking out. 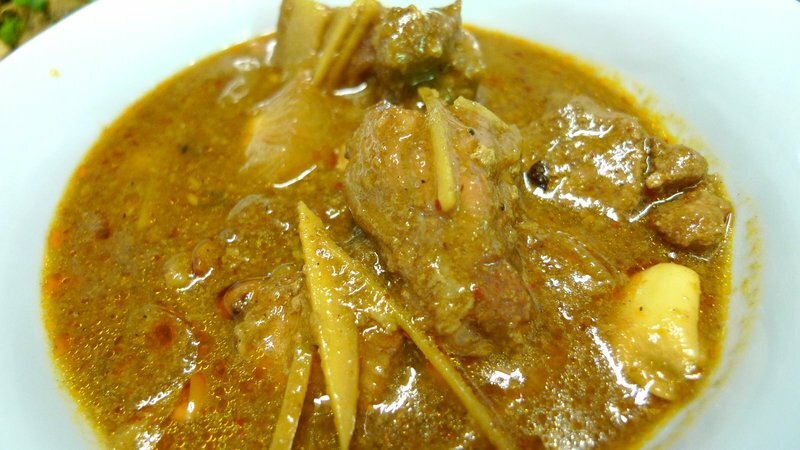 @CurryPuffy – Let’s put it on your itinerary. As for whether the restaurant lets you pick, that’s a fantastic question and one for which I do not have an answer. @fauquet – Michael, not being sure of the exact origins of the name, I double-checked with Wikipedia and its entry corresponds with my memory of what I’ve been told. I’ve pasted some of it below for your convenience. As for the question of colinization, while Thailand was never formally colonized by a European power, it was invaded by the Japanese during WWII and large concessions of land were made to both the British and French at various times to avoid a confrontation that might lead to colonization. For those reasons, I always feel like the claim of never being colonized needs an asterisk next to it.The country’s official name was Siam until June 23, 1939, when it was changed to Thailand. It was then renamed Siam from 1945 to May 11, 1949, after which it was again renamed Thailand. The word Thai (ไท) meaning “freedom” in the Thai language; it is, however, the name of an ethnic group from the central plains (the Thai people). A famous Thai scholar argued that Tai (ไท) simply means “people” or “human being” since his investigation shows that in some rural areas the word “Tai” was used instead of the usual Thai word “khon” (คน) for people. The Thai use the phrase “land of the free” to express pride in the fact that Thailand is the only country in Southeast Asia never colonized by a European power.